An added extra to the International Paris Air Show Le Bourget, Aerospace Meetings Paris is an outstanding tool to save time and meet the contacts you want to see! It gives you the possibility to easily meet the biggest procurement players from the field of aeronautics and aerospace in a B2B setting. 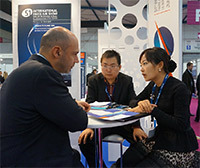 The conference program offers a unique opportunity to find out about the buying policies of large groups and to join the debate. Due to this previous success, a new edition of our traditional service is launched, in which we offer attendees the opportunity to participate in “speed networking”.